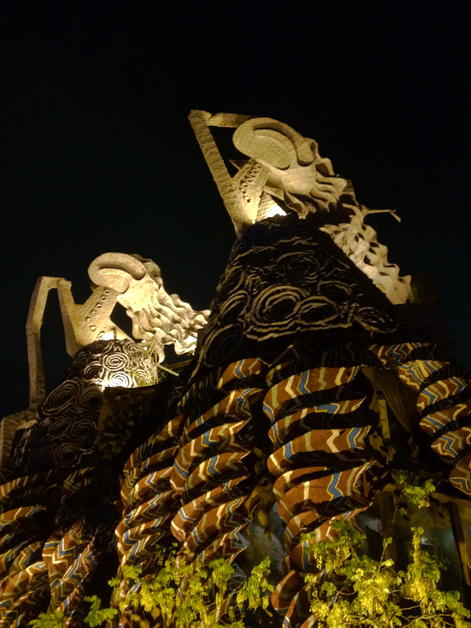 The oddly-named Five Cent Driftwood House is a fair trek from the centre of Taipei, but if you’re ever in the Taiwanese capital then it’s worth the journey if only to gawp at the restaurant’s extraordinary design. The bizarre, twisted exterior and the even odder, cavernous multi-level interior almost defy description. 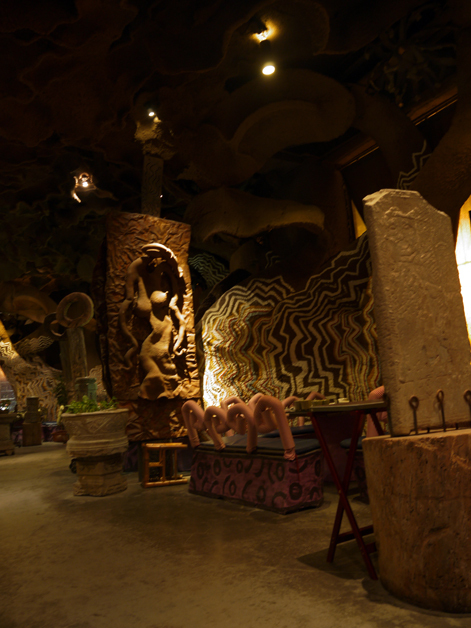 To my uneducated Euro-American eyes the restaurant looks like a Gaudi-Gauguin mashup with its organic, asymmetrical forms and vaguely aboriginal, Polynesian aesthetic. 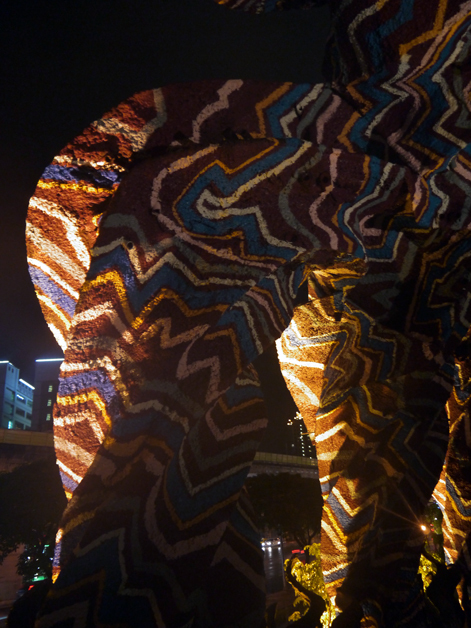 It was almost impossible to capture the utter scale of this building’s weirdness in one photo (at nighttime anyway). One of the ground floor tables. Yes, the seats look funky but are brutally uncomfortable. If you don’t speak or read Mandarin though, be prepared for some rough and ready service. Although the lengthy menu is in English, you order by ticking boxes on a form and then handing it to a waiter. Since my Mandarin is worse than my art history, I had to wait a small ice age for my waiter to find an English-speaking colleague. Service in general was slow, probably due to the epic amount of floor space each waiter has to cover – attempting to order more drinks or ask for the bill was an exercise in futility. In another quirk the bill is settled at the reception on the ground floor rather than at your table. Probably helps preserve the waiters’ shoe leather. That pond is full of koi and utterly monstrous beasts resembling carp. Just NT$220,000? I’ll take two. I was expecting something more inventive from my bowl of rice with sweet potato. 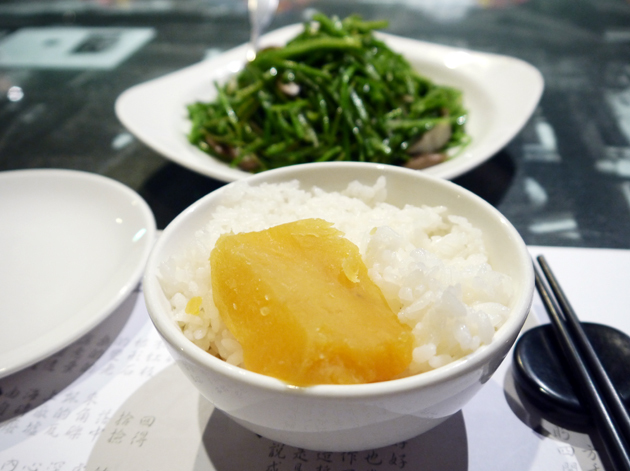 What I got was a bowl of steamed rice topped with a slice of sweet potato. It is what it says on the tin I suppose, but the relatively tough, chewy rice also tasted as if it was plopped out of a tin. Sometimes ‘what it says on the tin’ isn’t always a good thing. I also expected better from the pork jowl roasted in a miso sauce. 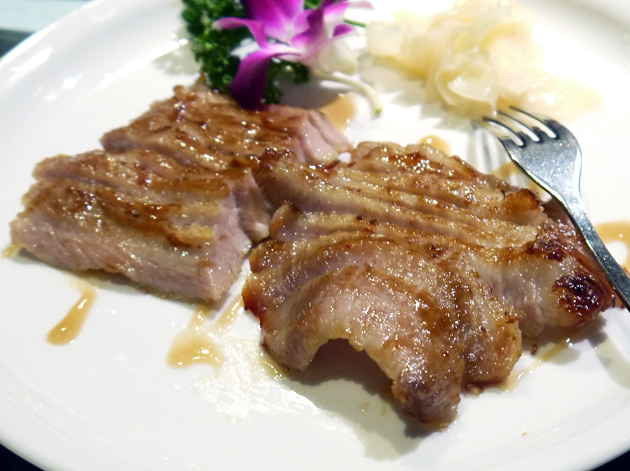 The portion was generous and the sauce was surprisingly fruity, but the thin, fatty slices of pork were surprisingly lacking in character and depth of flavour. At least the pickled ginger helps cut through the fattiness. The steamed sea bass was better, but then you’d have to try pretty hard to screw up this Chinese staple. 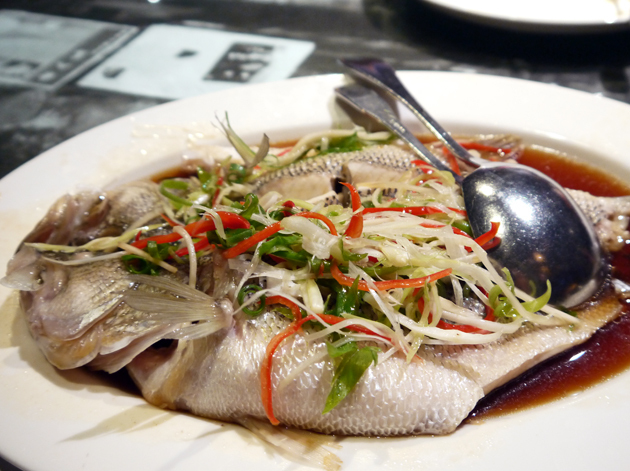 The whole fish was big and fresh with plenty of ginger and the odd slice of chilli complimented nicely by lots of soy sauce. Despite the sheer amount of fish, this proved to be surprisingly light. 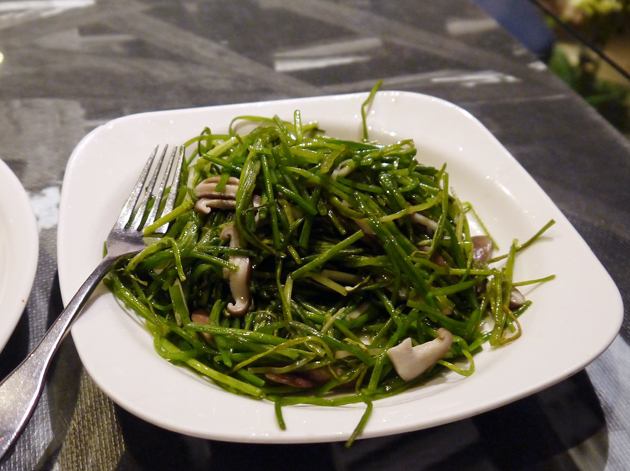 As the massive plate of crisp, bitter but refreshing greens with mushrooms in fragrant sesame oil arrived at my table, it dawned on me that the portion sizes were probably designed for group dining rather than single diners like myself. The staff hadn’t tried to warm or advise me of this, but at least I was getting more than my five-a-day. My dinner ended on a sour note with the dessert of green tea and coconut mochi. 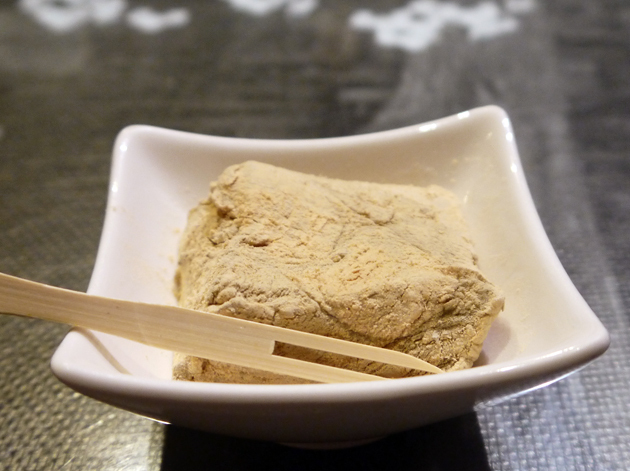 The very dry, dusty and nutty block that arrived on my table resembled a poor imitation of halva. It didn’t resemble the mochi I’d tried elsewhere in Taipei and it didn’t taste anything like coconut or green tea. 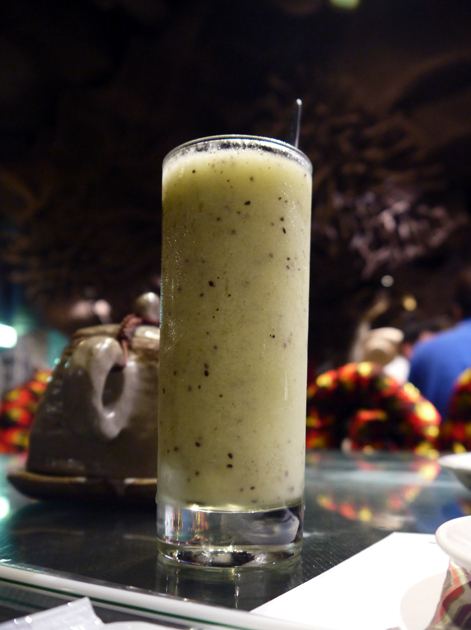 I had to wash down the dusty dessert with some kiwi fruit juice. Although it was relatively thick, its heavily watered down taste was disappointing given the abundance of fresh fruit and squeezed-to-order juices available in many of Taipei’s street markets. 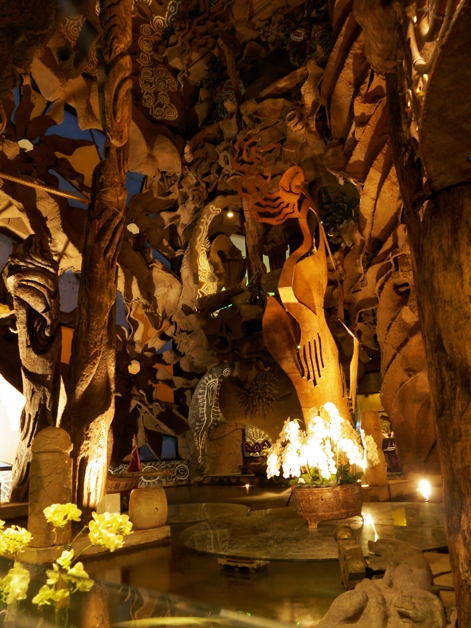 Check out Five Cent Driftwood House for its funky looks, but not for its food. Although there are some dishes worth having, finding them in the tome of a menu and then dealing with the foot-dragging service just isn’t worth it. 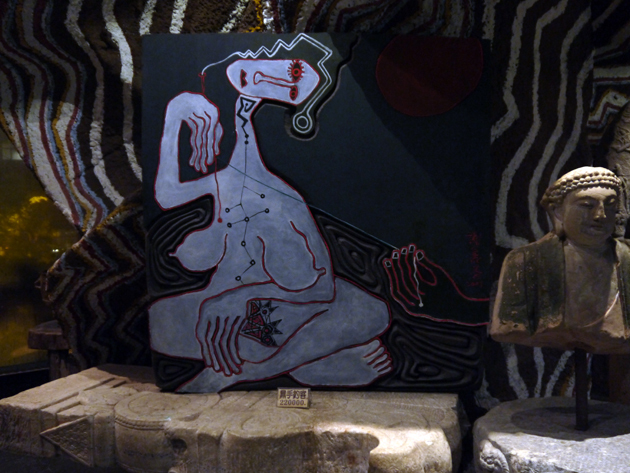 Opening Hours: seven days a week 11.00-14.00 and 17.00-21.00. Tags: five cent driftwood house, mochi, pork, restaurant, review, sea bass, sweet potato, taipei, taiwan. Bookmark the permalink.